Product prices and availability are accurate as of 2019-03-17 17:49:41 EDT and are subject to change. Any price and availability information displayed on http://www.amazon.com/ at the time of purchase will apply to the purchase of this product. Vegetable Botanical Name: Beta vulgaris Other Common Names: Vegetable Duration: Biennial Vegetable Days to Maturity: 55 Vegetable Seeds Per Oz: 2100 Vegetable Height: 6" to 12" Vegetable Spacing: 2 in to 4 in Vegetable Planting: Direct sow outside as soon as the ground can be worked. Can also be fall planted. Plant about 4" apart and 1/2" below soil surface. Rows should be spaced at 12"-18" apart. Vegetable Seed Saving: Allow seed heads to dry on plants; then remove heads, break them open, and collect seeds. Clean and dry the seeds before storage in cool dry conditions. 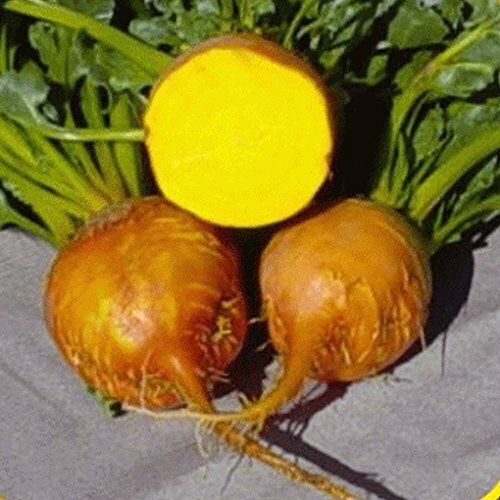 Vegetable Description: Burpee's Golden first appeared in seed catalogs in 1828, advertised as a lovely deep yellow beet that would not bleed. However, beets seem to have originated in the Mediterrenean region, where people grew them for thousands of years. Later, beets grew in Germany and Holland and were used as cattle fodder; they were later imported to England for this purpose, but the poor began to raise them for an affordable food source. American colonists later brought them to the New World, where they became a commonly enjoyed food both for their roots and their greens.